CHICAGO – While the man-child archetype has been cheerfully skewered and celebrated by Apatowian comedies ranging from “The 40-Year-Old Virgin” to “Step Brothers,” this year has so far produced two intriguing indie comedies that take a somewhat more serious look at a developmentally arrested psyche. Neither film is flawless, but they sure would make a superb double feature. Both Todd Solondz’s “Dark Horse” and Mark and Jay Duplass’s “Jeff, Who Lives at Home” center on adult male protagonists who believe they are destined for great things, despite the fact that they have yet to leave the family nest. These overgrown adolescents busy their minds by obsessing over the meaning of numbers and signs, while stalling in their efforts to build a respectable life. Yet whereas Solondz’s antihero contemptuously blames his successful brother for his own failings, the Duplass’s pair of brothers are more complex. While Jeff (Jason Segel) does indeed live at home, his brother, Pat (Ed Helms), lives what appears to be a fully functional adult life—complete with a job, a house, a car and a wife, Linda (Judy Greer). However, it’s clear from the get-go that there is tension building between the couple, as Pat’s childish impulsiveness threatens to drive Linda into the arms of another man. When Pat’s fears of infidelity are stoked after spotting Linda lunching with a co-worker, he enlists his wandering brother to spy on them. Meanwhile, the boys’ weary mother, Sharon (Susan Sarandon), finds her mundane routine at work pleasantly disrupted by a series of messages from a secret admirer. As these scattered plot lines intersect and overlap, the Duplass’s longtime editor, Jay Deuby, proves to be a master of pacing (a strength that may greatly assist his next film, Judd Apatow’s “This is 40”). As each character inches closer toward reaching an inner epiphany, the Duplasses build suspense around their unpredictable destination. There are also several laugh-out-loud moments to be had, particularly during an awkward exchange between Jeff and a bewildered waitress (played by Mark Duplass’s wife and “The League” co-star, Katie Aselton). For its first two-thirds, the picture is a lightweight yet entertaining trifle, but like “Dark Horse,” “Jeff” derails in its final act. Jeff, Who Lives at Home was released on Blu-ray and DVD on June 19, 2012. One of the film’s finest moments arrives prior to the opening credits, as Jeff delivers a goofy yet disarmingly heartfelt monologue about how M. Night Shyamalan’s “Signs” illustrates that there is hidden meaning in the universe. Unfortunately, the Duplass brothers decided to take a cue from Shyamalan by concluding their otherwise diverting tale with a wildly improbable deus ex machina. It’s the sort of infuriating cop-out that doesn’t allow the characters to grow beyond their own warped perception of reality, and the script’s all-too-hopeful ending feels entirely fake. In a way, the Duplass’s previous directorial effort, “Cyrus,” suffered from a similarly softened final act, but that film was far more ruthless and honest in its satirical portrait of men who refuse to grow up. What saves “Jeff” by a thread are the four principal performances, which are richly textured and at times, painfully raw. Greer has a tearfully enraged confrontation with Helms that rings so true that it’s almost difficult to watch. It’s so good that it makes the film’s forced Hollywood ending feel all the more disappointing. Mark and Jay Duplass have been especially prolific of late, and it’s clear that not every one of their films will be as great as their debut effort, 2005’s fractured relationship comedy, “The Puffy Chair.” But I suggest that they take some time to refine their cinematic language (and wean their cinematographer, Jas Shelton, off his reliance on distracting quick zooms) before diving into their next feature. “Jeff, Who Lives at Home” is presented in 1080p High Definition (with a 1.85:1 aspect ratio), accompanied by English, French, Spanish, Portuguese and English Descriptive audio tracks, and includes Blu-ray and UltraViolet versions of the film. Sadly, the disc doesn’t contain a single special feature, which is a shame considering that an audio commentary or even an extended interview with the ever-charismatic Duplass brothers would’ve been most enjoyable. 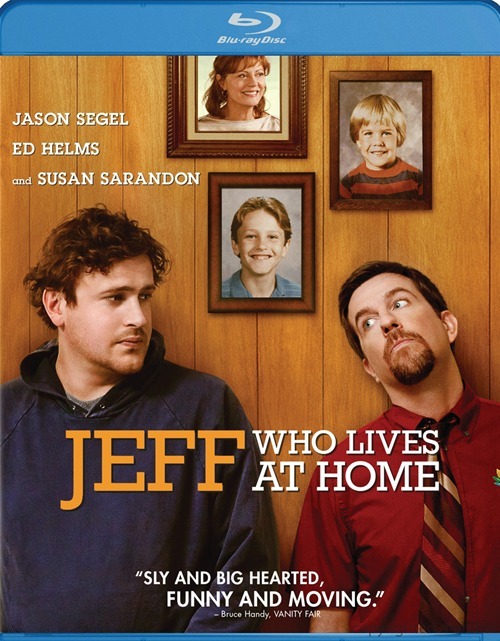 ‘Jeff, Who Lives at Home’ is released by Paramount Pictures Home Entertainment and stars Jason Segel, Ed Helms, Judy Greer and Susan Sarandon. It was written and directed by Mark and Jay Duplass. It was released on June 19, 2012. It is rated R.